Online ordering menu for Muscle Maker Grill. OUR STORY FOUNDED IN 1995, Muscle Maker Grill provides its guests healthier versions of mainstream-favorite dishes that taste great, making it easy, affordable and enjoyable to eat healthy. 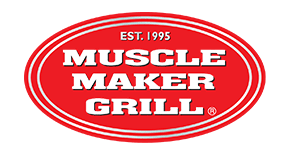 Muscle Maker Grill’s diverse menu was created for everyone – fitness enthusiasts, those starting their journey to a healthier lifestyle, and people trying to eat better while on-the-go. Providing “Great Food with Your Health in Mind,”™ Muscle Maker Grill’s menu features items with grass-fed steak and all-natural chicken, as well as options that satisfy an array dietary preferences from vegetarians to the low-carb consumer and guests following a gluten-free diet. Muscle Maker Grill does not sacrifice taste to serve healthy options. Now, guests can have delicious, nutritionally balanced food without the regret. More than just food, Muscle Maker Grill restaurants are a friendly, relaxed and social environment where guests can enjoy great-tasting food and engage with fellow health enthusiasts in their area. Order online for carryout or delivery!